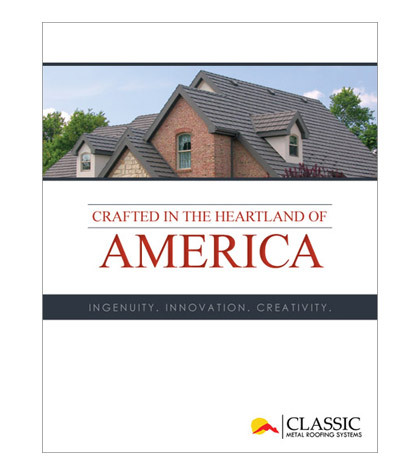 At Classic Metal Roofing, we take “Made in America” very seriously. It is part of who and what we are as a company. While we do export significantly to other countries, and those countries mean much to us, most of our product is sold in the United States. For that reason, we insist that our products be made in the USA from only American-made raw materials. We do this in order to support the hard-working American homeowners who purchase our products. We also do it in order to safeguard the quality of our products. Many companies out-source manufacturing or raw materials to other lands but, in so doing, give up their ability to control quality. This jeopardizes their customers’ futures. We will not do that. Many years ago, strictly on a temporary trial basis, we attempted to have a unique and new product made for us overseas. It was a quality control nightmare. Right then and there, we promised ourselves … and our customers … never again would we do that. We have not broken that promise, nor will we. We believe that our customers care about “Made in America” as much as we do so we will not waiver in our commitment to it. Manufacturing has been a huge part of our country’s growth and prosperity. While it has had significant challenges in recent years, we believe that manufacturing in the United States must – and will – rise again. We are committed to encouraging US manufacturing through our leadership involvement in trade associations as well as various business organizations. Just as we know that our homeowners care about the environmental benefits of our products enough to base part of their roofing decisions on those, we also hope that you will join us in a quest to support US manufacturing through the purchase of high quality, tested, and proven 100% American-made building products.